You can take part in the races that will feature a specific Halloween game, and you will also get double Rizk points, which means that you will level up twice as fast. The prize pools for the races vary between €1,000 and €7,500, and total to an amount of €85,000! More information about the levelling system at Rizk Casino and the Wheel of Rizk can be found in our Rizk review. As a new player you can also get an interesting welcome bonus! Check the Rizk Insider on the website for more information on the Halloween games for each tournament. Terms and conditions apply. Please read the promotional terms before participating. Planet of the Apes, Blood Suckers 2, Dracula, Blood Suckers, The Invisible Man, Frankenstein, Immortal Romance, Lost Vegas, 7 Sins, Lucky Halloween, Pumpkin Smash and Reactoonz. 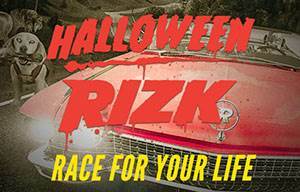 Race for Halloween at Rizk Now!